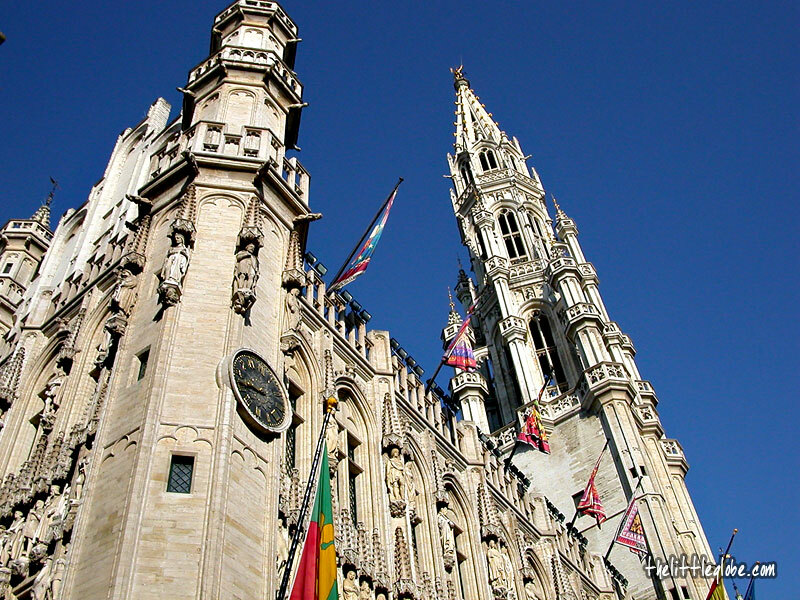 I have been to Brussels a few times before but never really did visit the city. Neither did I spend more than a couple of hours in the city previously, as it was always a place for transit. This trip, though meant to come here to catch the plane to London, we deliberately made it here a day earlier wanting to see the city a little bit more. Paris to Annecy in less than four hours, TGV is impressive. That made it possible to visit a friend of mine in Annecy for the weekend. After meeting up with my friend at the train station, we grabbed some croissants from a shop for breakfast and dicussed where to visit for the two days. The plan was: Day 1 - visit Chamonix and Day 2 - visit Annecy old town in the morning and a nearby village Le Grand Bernand in the afternoon. It was Sunday morning when we strolled around the Old Town of Annecy. 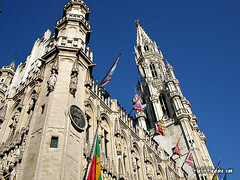 We started at the square in front of the Old Town Hall and Church of Notre-Dame de Liesse. Rambling through the town, with a local resident leading the way I hardly had a chance to find out where I was going, being too dependent this time. The Old Town Hall is a 14th century building with yellow façade that formerly housed the administrations of the town council. 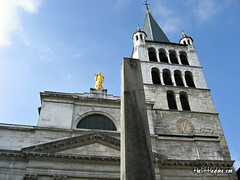 The adjacent Notre-Dame de Liesse has a neo-classical façade and a Romanesque bell-tower. Through the narrow street we came to the Thiou quay, a very attractive sight running along the waterway. This is one of the main sights for the tourists, residents and artists in Annecy. The Palais de l'Ile, a former prison that was built on a diamond-shaped “island” in the middle the Thiou Canal connected by two bridges to both the banks. 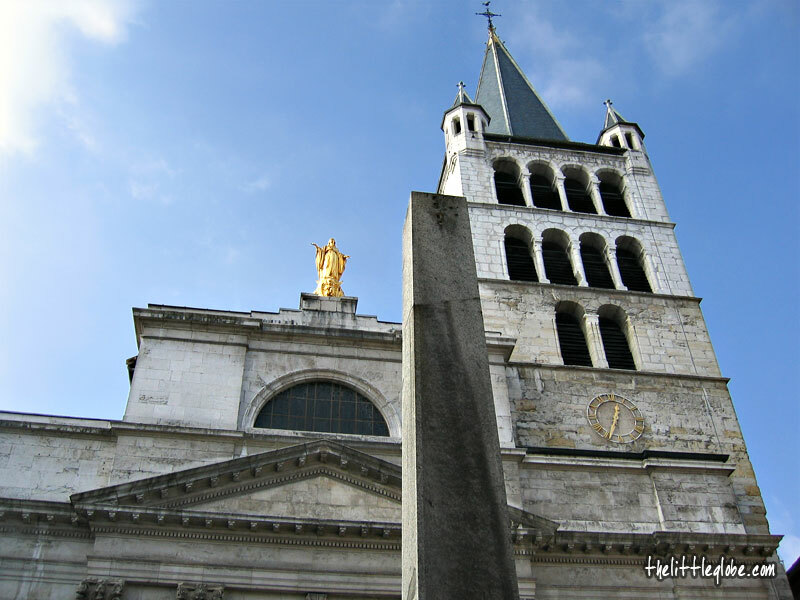 Not far away, there are the 15th century Church of St. Maurice and the 17th century Church of St. Francis. 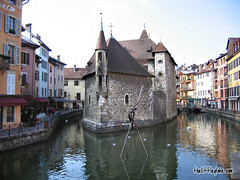 The Castle of Annecy is located to the south of the quay. This former residence of The Counts of Geneva is the landmark of Annecy. From the castle, via the Perrière Gate we returned to the Thiou quay. It was a nice walk then from the quay to the port on Annecy Lake. The scenery along Quai Nepoleon III in Jardin de l’Europe is spledid with the view of the port, the Castle, snow capped mountain and the lake. I really wish I had more time for all these. 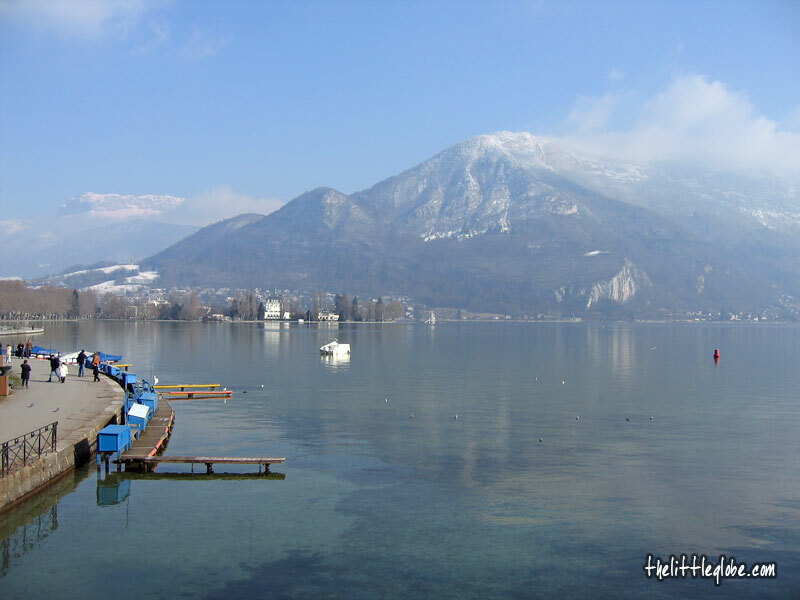 Maybe one day I will go back to Annecy. Basel is Switzerland’s second largest city, situated on the bank of the River Rhine with its city boundary interestingly stretching to the French and German frontiers. 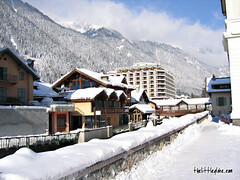 We spent two nights there, making Basel as the base to visit Freiburg (40 minutes by train) in Germany and Montreux. Having actually spent only half a day walking around the city, I must say we saw only a little of it. 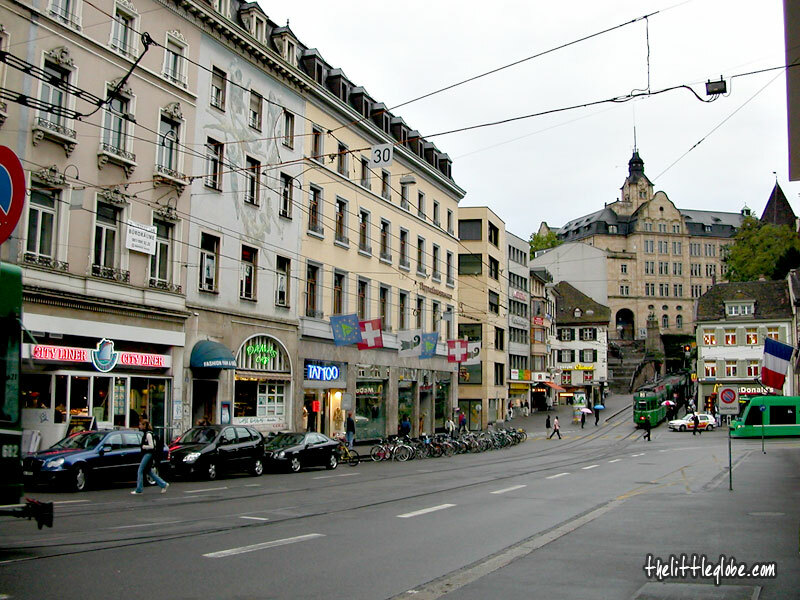 Indeed, to me, Basel is that sort of place that has more to offer to business visitors rather than tourists. With the Mobility Card given to us by the hotel while check-in, we were entitled to free tram and bus travels throughout the city. Having not decided where to go, we boarded a tram at Barfüsserplatz hoping that it would gave us some ideas on where to go. It turned out well though. The tram went from Barfüsserplatz to Marktplatz (Market square) then continued to the other side of the city across the Rhine via the Mittlere Rheinbrücke (Middle Rhine Bridge). We then got off the tram and decided to walk from the bridge back to the old town area stopping by some interesting places. There is a nice view of the medieval Münster (Cathedral, one of Basel’s landmarks) by the river from the brigde. At the Marktplatz, the red Gothic-style Rathaus (Town Hall, built in the 16th century) dominates the skyline and that's where the cultural centre of the city. Barfüsserplatz is just a few blocks south of Marktplatz. 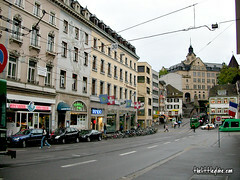 Here we found lots of shops, cafés, restaurants and fast food outlets; also that's where most of the trams make a stop. 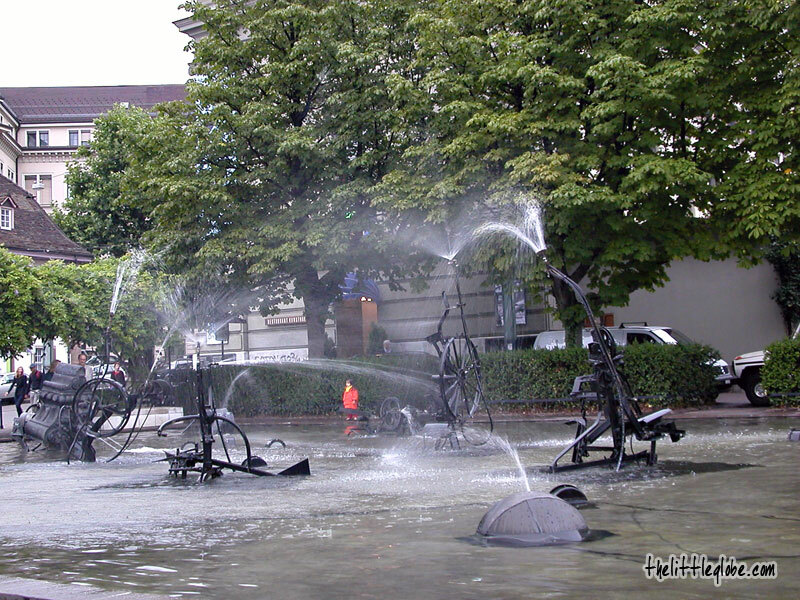 Next to the theatre, the Tinguely Fountain is also worth a visit. This wonderful work by Jean Tinguely consists of some “kinetic sculptures” moving and spraying water in a pool. That's more or less sums up on what I saw in Basel! 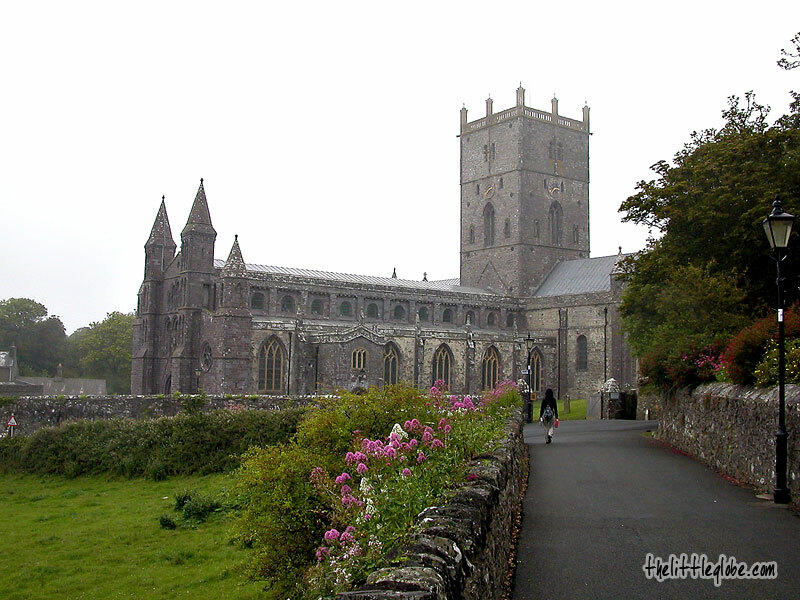 We rented a car for the weekend to drive along the southern coast of Wales visiting Caerleon, Solva and St David's. The reason to stop by Caerleon was to check out the Roman Amphitheatre. This quiet little toen beside the River Usk was the site of a Roman Legionary Fortress and also believed to be the location of the legendary King Arthur's Camelot. We first arrived in the village at the Roman Bath Museum. Unfortunately, we were unable to visit the museum as it opened late on Sunday so did the tourist information office. 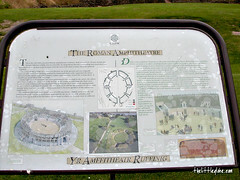 We then got the direction to the site of the Roman remains from a helpful local bloke. There is not much left of the fortress wall and the barracks, whereas the amphitheatre looked a lot more impressive with grass over the ruins. 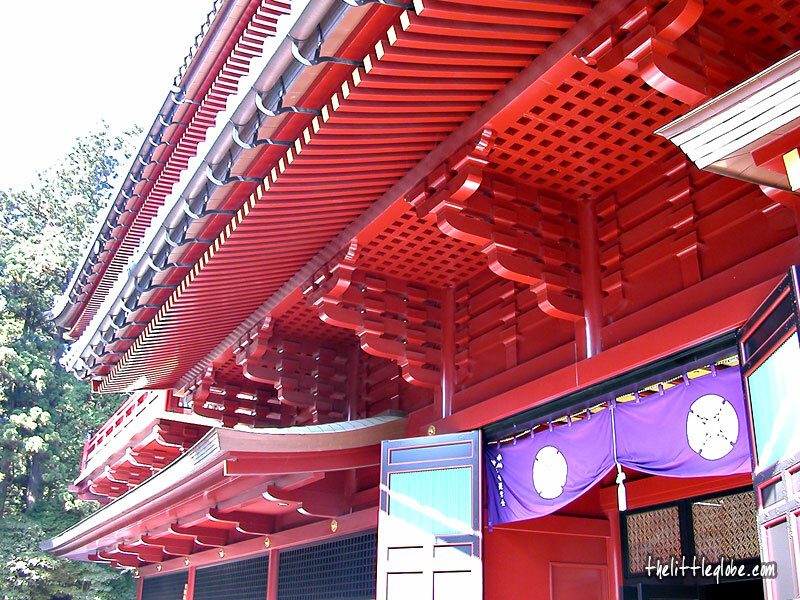 This historical site dates back to the 1st century. 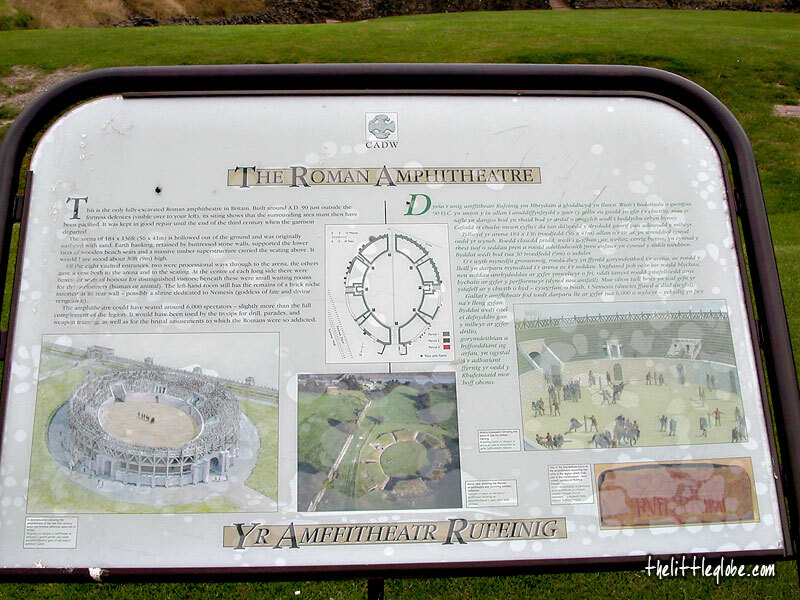 The Roman made this place a very importan t settlement with fortress, barracks, infantry, amphitheatre and bath, in fact one of the major military centres for the Roman Army in Britain. 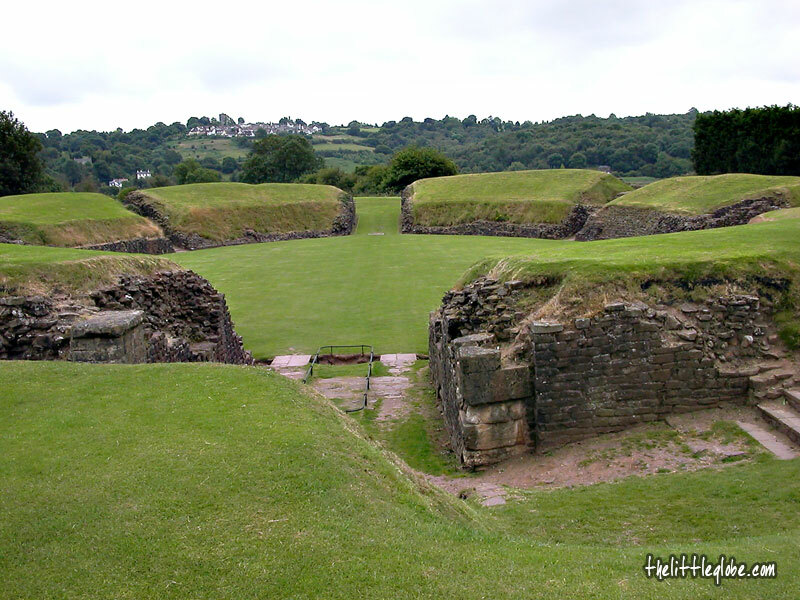 When traveling to Southern Wales, visitors should try to find time to visit Caerleon. It’s easy to find and almost tourist free (despite the fact that it was a fine summer weekend, there was no other visitors around when we were there). 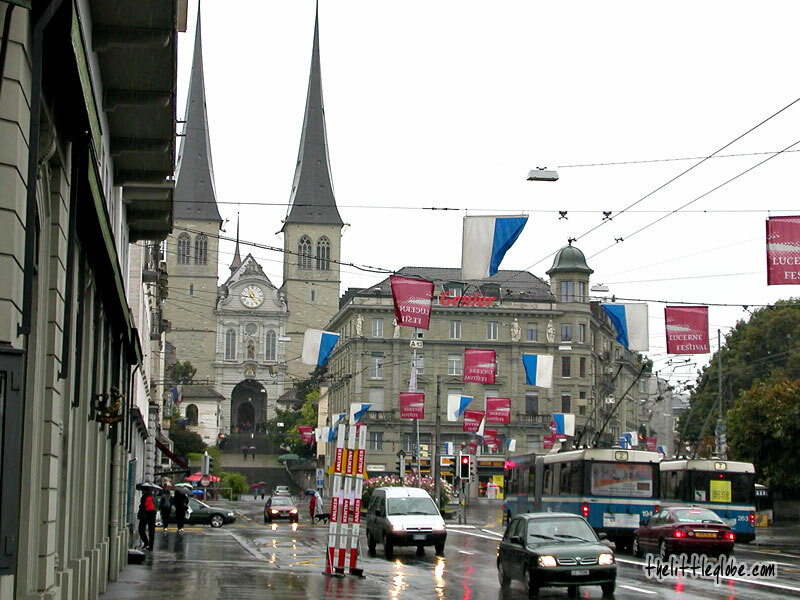 Using Basel as the base, we traveled to Montreux by catching one of the early morning trains. 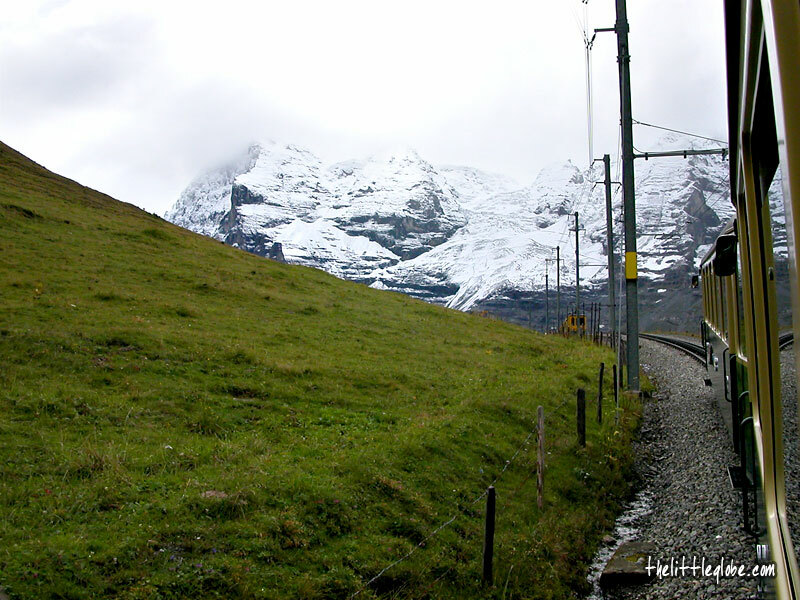 The train ride between the banks of the River Rhine and Lake Geneva in the Swiss Riviera offered magnificent view. 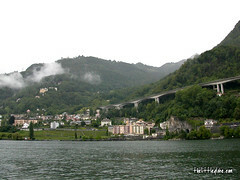 What was just not complimenting the scenic ride was the rain, that was greeting us “Welcome to Switzerland” since we arrived 2 days ago. After our visit to Strasbourg, we crossed over the French-German border to Baden-Baden. 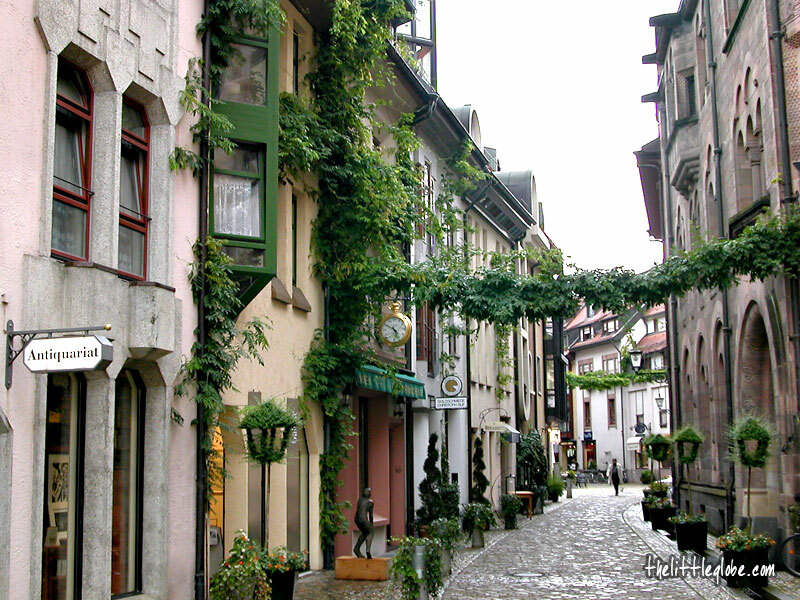 This cosy and relaxing little town is located on the western foothills of the Black Forest in Baden-Württemberg, Germany. We first made a stop at the tourist information centre on the way entering the town centre to check out what to see and get a tourist map. As suggested by the people from the tourist information centre, we started the town walk at the Trinkhalle (Pump Room). 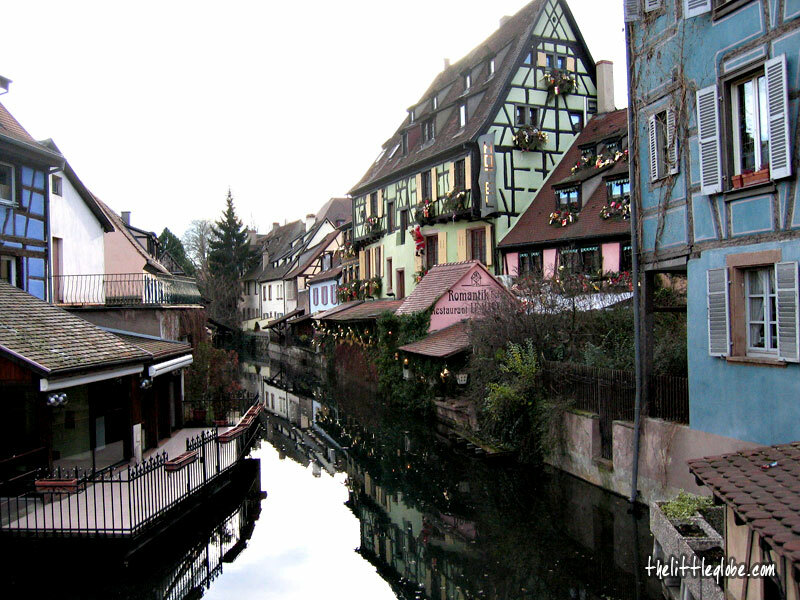 From Colmar to Strasbourg, we continued our travel in the Alsace region of France. 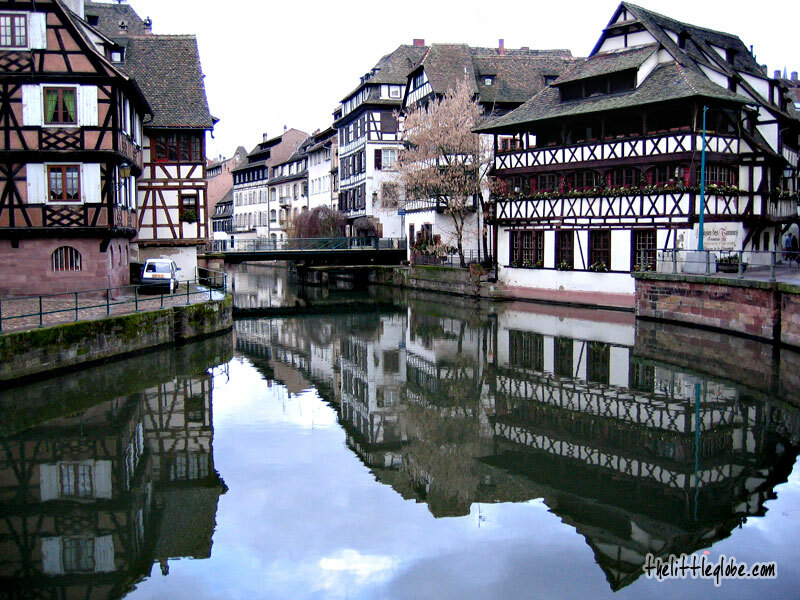 The Germanic name “Strasbourg” means “the city of roads”. Due to its location just west of the French-German border, Strasbourg captures the cultures of both sides. The old city (Altstadt) centre of Strasbourg was built on the island formed by the two branches of the river Ill. We started out visit at Ponts Couverts (covered bridges linked by medieval watchtowers) in the Little France (La Petite France). 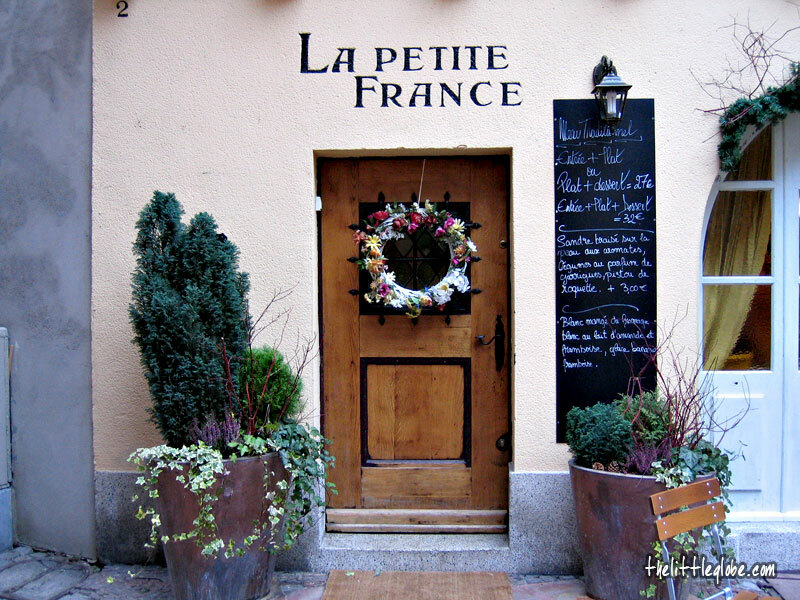 The Little France is a picturesque and romantic quarter that features narrow streets, the banks of the Ill and timber-framed houses reflected in the canal. 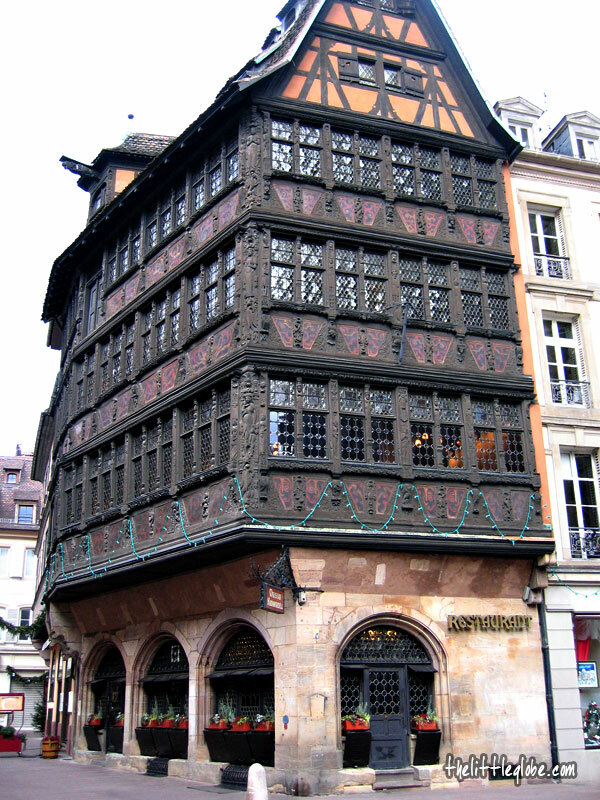 It’s one of the best conserved quarters in Old Strasbourg. The quarter was once the home of fishermen, tanners and millers; now it’s filled up with tourist restaurants, hotels and souvenir shops. We then walked from Rue des Moulins to Pont Saint-Martin to get a nice view of the dam and the canal. 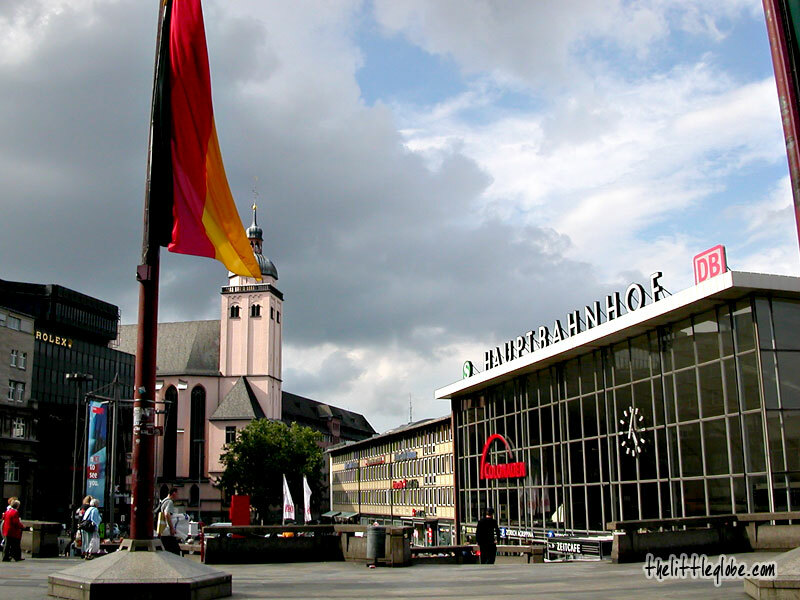 The Gutenberg Square (Place Gutenberg) was next; the square was named after the resident of the city who invented moveable-type printing press and then printed the first bible. A statue of him is in the middle of the square. Just a block away, there is the famous Cathedral Square (Place de la Cathédrale) of Strasbourg which boasts typical half-timbered houses which many are now hotels, restaurants and souvenir shops. 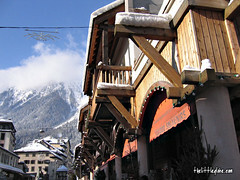 There are two notable ones, Maison Kammerzell and Pharmacie du Cerf. 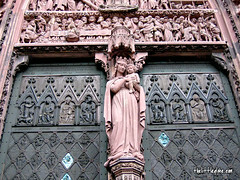 The former has a highly elaborate carved façade dating back to the 15th and 16th centuries. Once a rich merchant’s mansion, it’s now a popular restaurant. 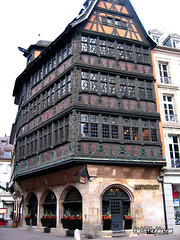 The latter, situated at the beginning of the Rue Mercière is believed to be the oldest pharmacy in France (13th century). 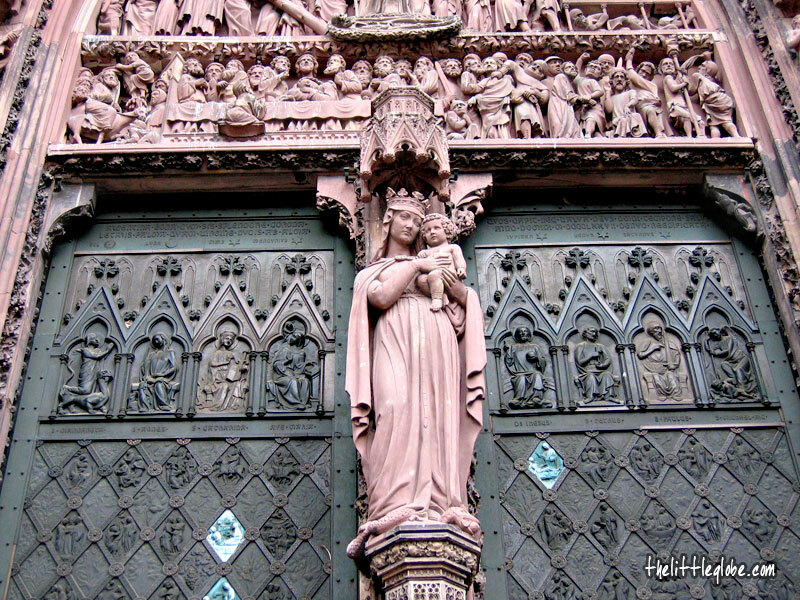 The Notre Dame Cathedral of Strasbourg in the centre of the square was built over a span of three centuries (late 12th to 15th century). 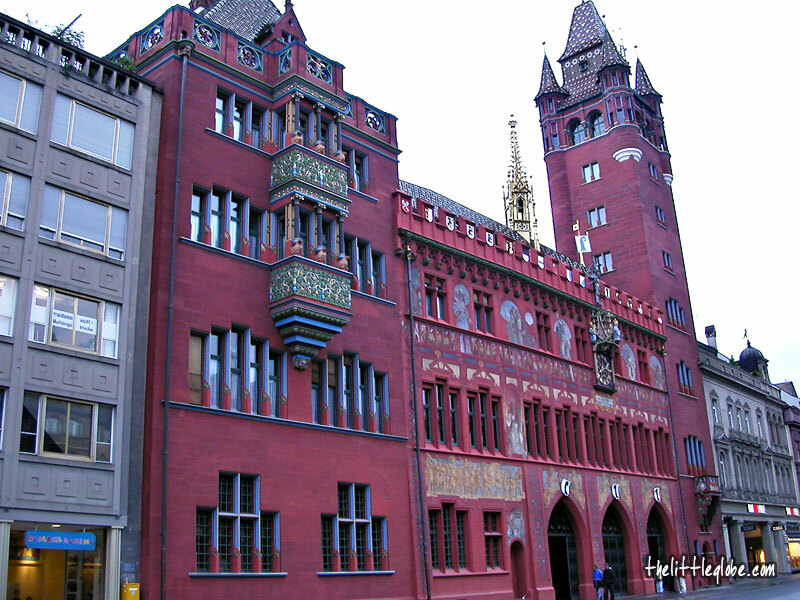 This magnificent red Vosges sandstone building is a masterpiece of gothic architecture. 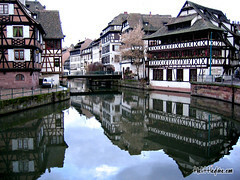 With its central location, Strasbourg is often known as the “the cross-roads of Europe”, a destination with cultural and political importance. Next stop - Baden-Baden in Germany. 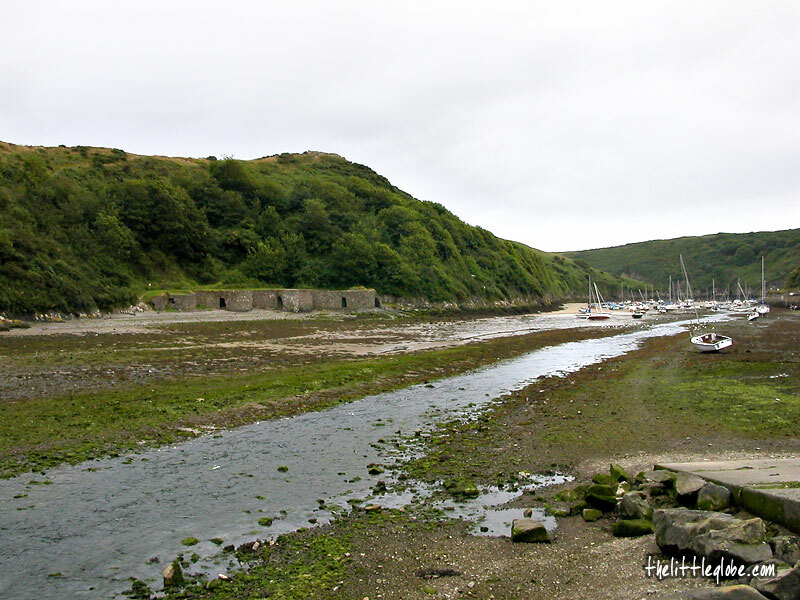 Solva (Solfach, in Welsh) is a picturesque little village I visited some years ago and I think it's worth writing about it here. It's located in the southwestern tip of Wales between Newgale and St. David's along the St. Brides bay. The scenery of the coastal route from Newgale to Salvo is marvellous with magnificent views over the secluded sandy beach. 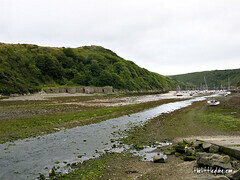 Solva is a pleasant village sitting at the top of an inlet that runs down to the sea. This made it a natural harbour ideal for trading boats previously. Today, few local fishermen and sailboat enthusiasts use the harbour. When we were there it was low tide, so all the boats were left high and dry in the valley. I would imagine a much more beautiful view when the tide is high and the valley is filled up with water. We parked the car at the car park next to the harbour and in front of it there was a pub with some tourists and locals alike. The atmosphere of the whole setting was so cosy and restful. We strolled around the Main Street that has restaurants, pubs, B&B's and Welsh craft shops; probably the only place where all the shops are. 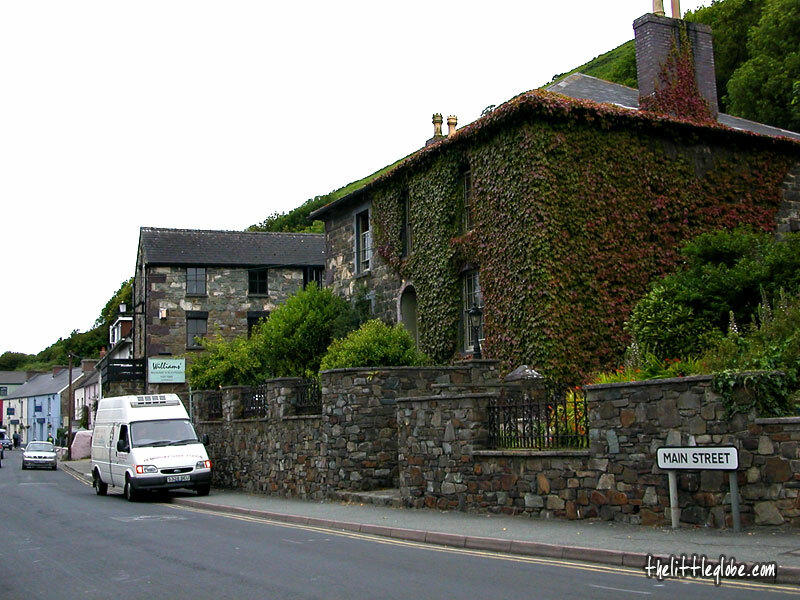 There is a shop called "Window on Wales" which has a lot to offer tourists such as quality Welsh wool clothing, pottery, books and confectionery. The Main Street is really attractive with the houses in many different colours. We picked a restaurant and had lunch there, very nice homemade soups. 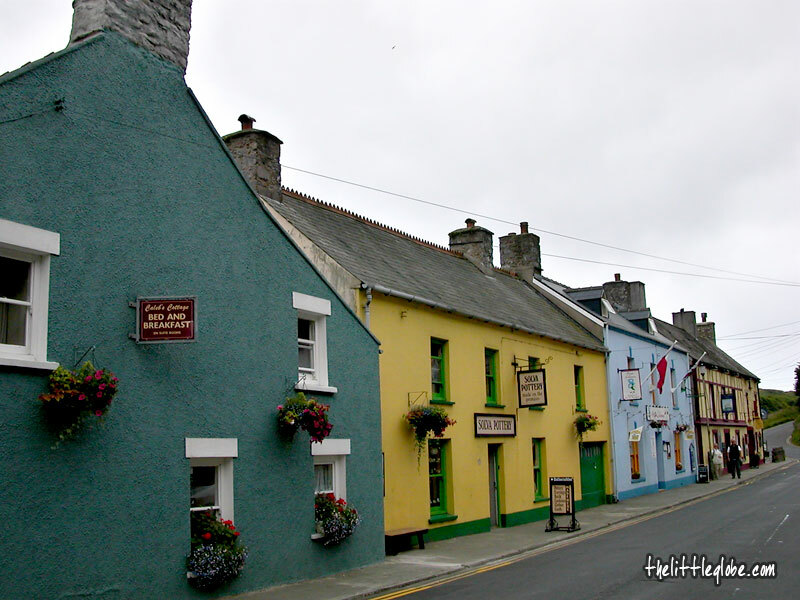 This nice little colourful village is a perfect place to chill out in summer months. Furthermore, it’s not awash with tourists. 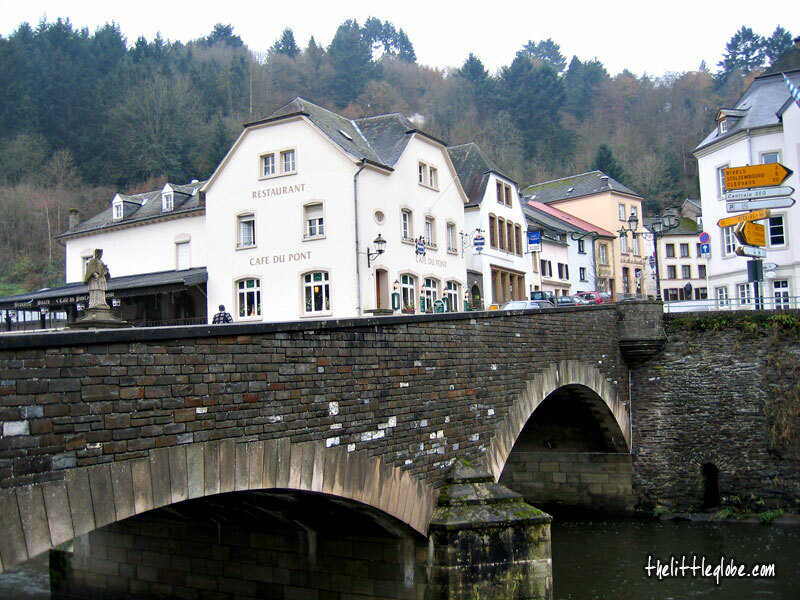 After having visited Clervaux and Vianden of the tiny European country, the capital city was the last stop of our weekend travel to Luxembourg out of Paris. 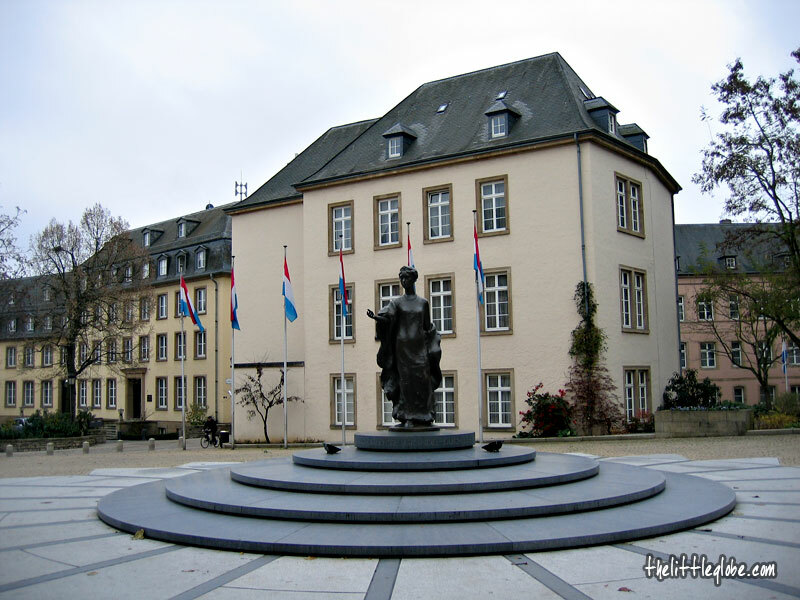 Everyday, as a relaxed cosmopolitan, Luxembourg City is receiving many tourists as well as European business and political elite. 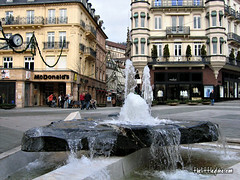 To get started with the city walk, we parked the rental car not far away from the Clairefontaine Square. 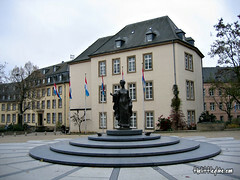 Right in the centre of the square is the statue of Grand Duchess Charlotte (a popular ruler of Luxembourg from 1919 to 1964). Heading east on the Autoroute, towards Alsace region, a friend and I started the weekend trip from Paris early on a Saturday morning. 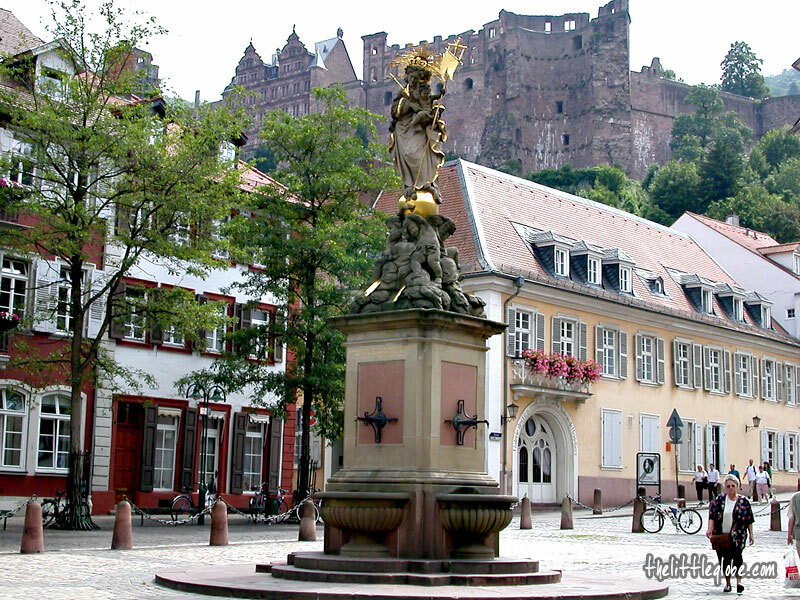 The itinerary included two Alsatian cities – Colmar and Strasbourg as well as a brief visit to Baden-Baden across the French-German border. Our first stop Colmar, is a charming city famous for its picturesque houses and medieval buildings. We started our city walk at the Little Venice (La Petite Venise). Yes, it’s indeed a postcard-like little area in the city with a canal that has beautiful settings on both sides. 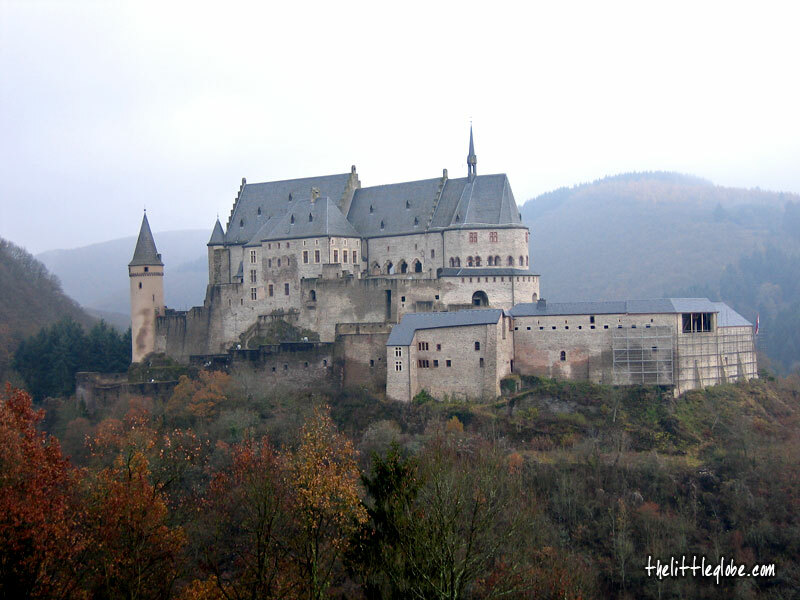 While we were driving down the hill heading for Vianden(we visited Clervaux the day before), a fairy-tale castle on a hilltop came into sight. That’s the Vianden Castle, probably the most visited tourist destination in Luxembourg. My friend and I decided to first check out the town and find a place for breakfast. We parked the car at a car park right beside the River Our. The riverside view was great with the houses by the banks and the hillside, the splendid landscape of Ardennes as well as the castle at the background. This is a small little quiet town. So it's not easy to find a place that did breakfast on an early Sunday morning but we managed to find a pub where the people were so kind to make us breakfast. Across the road from the restaurant, there's the house next to the birdge where the famous French poet Victor Hugo lived for many years and it’s now Victor Hugo Museum. After a leisure walk through the narrow quiet streets of the town, we drove up to the castle car park. The foundations of Vianden Castle date back to the 11th century and the main construction part such as the chapel and the palaces were constructed between the 12th and 13th centuries. The castle had been left to decay into a state of ruin since the begining of the 19th century. 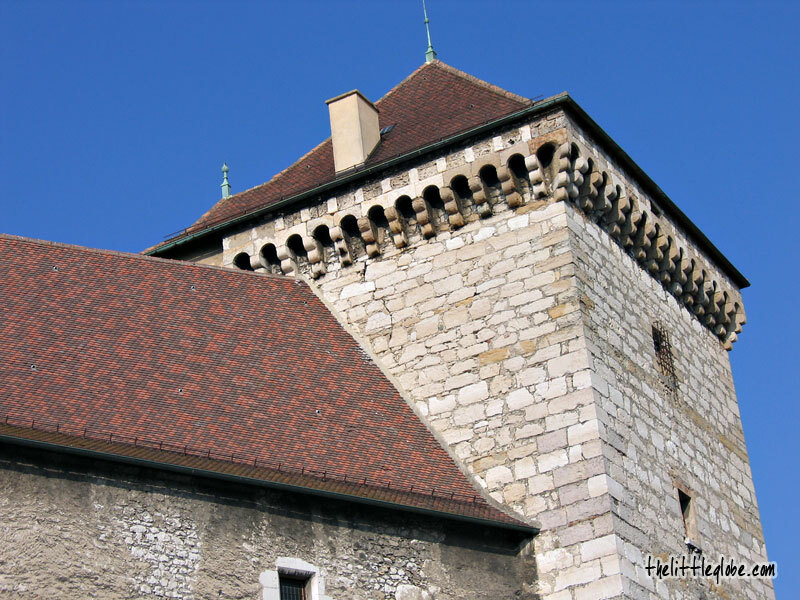 The current state of the castle you see today is the result of the restoration work since the 1970’s. We spent about two hours to see the entire castle. After the visit we drove uphill and found a good spot to take a few nice shots of the castle but the weather was too foggy. We then spent the afternoon in the capital - Luxembourg City. 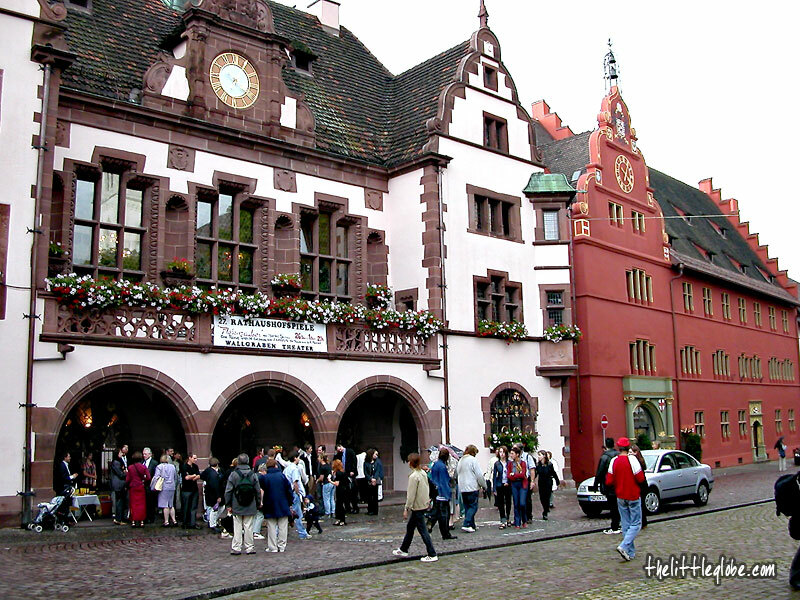 Just a short train ride from Basel (Switzerland) across the border, Freiburg im Breisgau is the gateway to the Black Forest in southwestern Germany. We (my wife and I) started our city walk at the Freiburg Tourist Information Office, about 350 metres from the train station. 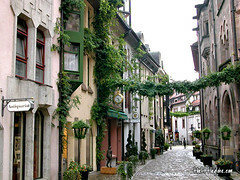 Later along Rathausgasse we saw one of Freiburg’s trademarks – the little canals (about a foot wide) with water running. The canals run along the streets in front of the shops (so, watch your steps when you wander around the town). Continued walking along Rathausgasse, we eventually arrived at the square (Rathausplatz) in front of the Rathaus (the New Town Hall). The Rathaus was built in the 1890’s and it’s a beautiful white building with typical German wooden decor. Via Eisenstrasse, we came to the Münsterplatz (Cathedral Square). The Münsterplatz is the main and also the largest square in Freiburg, featuring the Gothic style Cathedral (Münster) and a few attractive façades of historical buildings. 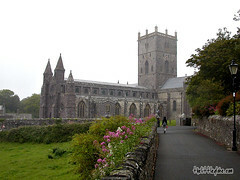 The Cathedral started as a Romanesque church in the beginning of the 12th century, later rebuilt and completed in French Gothic Style in the 1260’s. 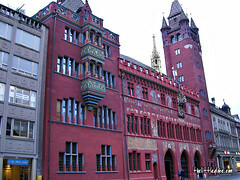 Another remarkable building in the square is the Historic Merchants’ Hall (Historisches Kaufhaus) which has a beautiful red façade decorated with coats of arms and statues. From Münsterplatz, we then took the route through Schoferstrasse to Konvikstrasse where we found an urban charm of nice alleys and houses restored using old façades displaying fine-looking coat of arms. On the way back to the train station(to catch the train back to Basel), we stopped by Salzstrasse for Schwabentor, a nicely decorated old tower gate. It never came into my mind to visit Freiburg as it’s comparatively unheard of as a major tourist attraction but I am really glad I didn’t miss it! It was at one of the weekends, during our stay in Paris, a friend and I rented a car to travel to Luxembourg. Our first stop was Clervaux, a peaceful and cosy town in the northern part of that little landlocked country which shares the borders with Belgium, France and Germany. 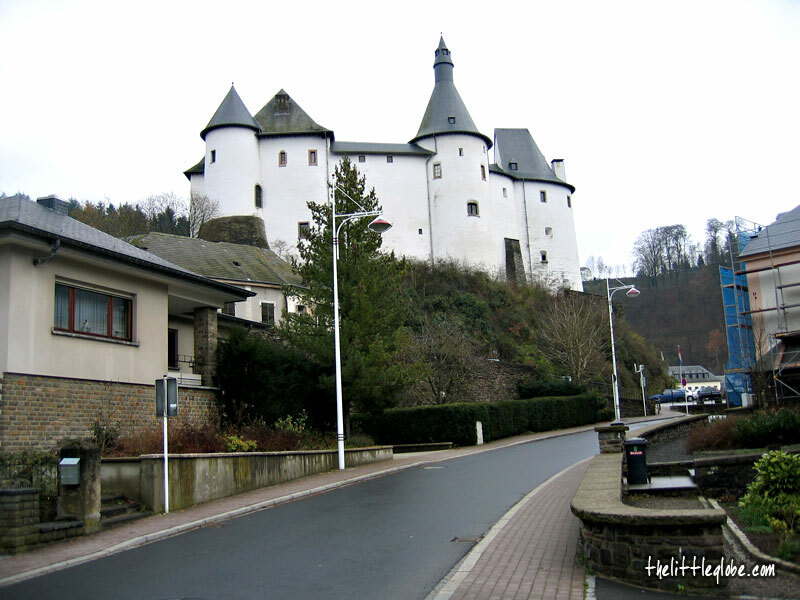 Clervaux started as a village during the middle ages and then turned into a market town. It’s a good place to spend a few hours to see what it has to offer as a medieval town without the tourist buses (at least, I didn’t see any). We parked our rental car at the car park below the castle. Right next to it we saw a photographic exhibition with a few huge photographs displayed with the title of “Images de Romanie” by Patrick Galbats. From there we walked to the Clervaux Parish Church at the back of the castle. 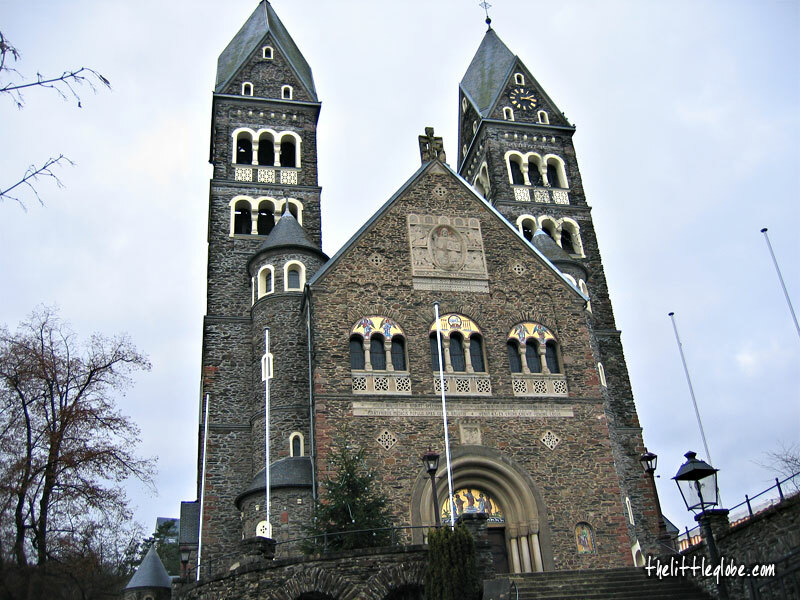 The church was built in Rhenish-Romanesque style in 1910 and looked great with the location at the hilltop. It was a Saturday afternoon in late November and the weather was not great, maybe that was the reason why the streets in the centre were so quiet while we wandered around the town. Anyway, the population of Clervaux is only around 1800. We later walked back to the car park and up the hill to check out the castle. 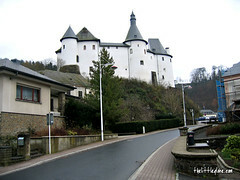 The Château de Clervaux was originally built in the 12th century and continually being enlarged till the 17th century. 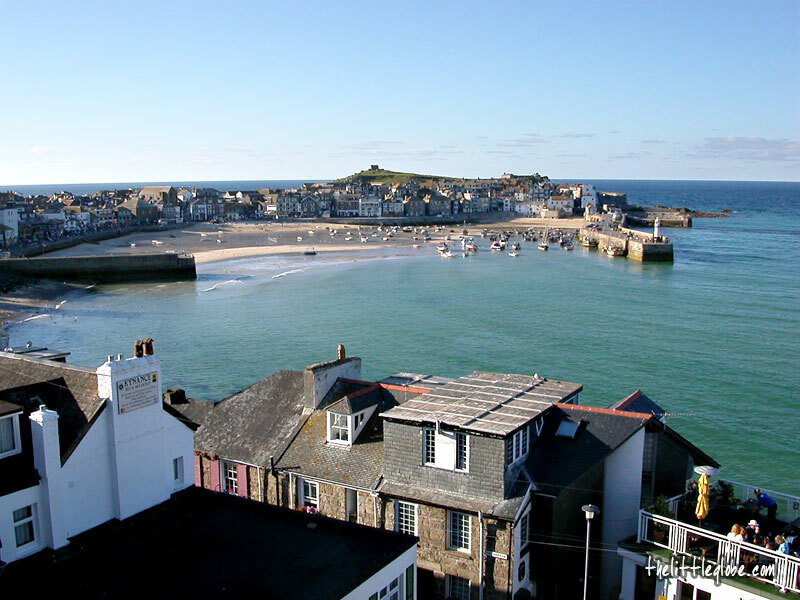 It was damaged during the Second World War and restored afterwards. 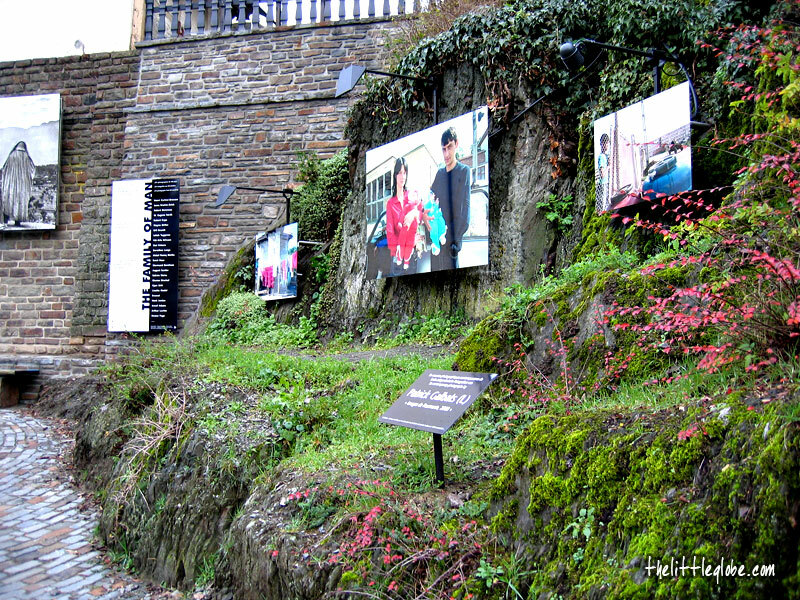 The castle now houses the photographic exhibition of “The Family of Man” by Edward Steichen. Apart from the exhibition section, I also saw the local authority office and tourist office in the castle. 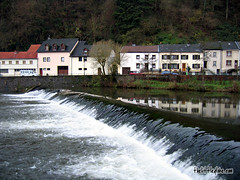 The next day we visited Luxemburg City and Vianden. I was in Paris on a business trip for more than two months and was planning for one of the weekends. I really wanted somewhere outside of France this time. Eventually, the decision was to go to Liverpool because I studied there and looked like it was a good time to visit my friends as well as some familiar places. EasyJet flew from Paris CDG to Liverpool, so it looked absolutely good for me. Upon arriving, my friend picked me up from John Lennon Airport. Most tourists who come to Liverpool are either football or Beatles’ fans, so this city is not touristy at all by the British standard. I chose first to visit the Pier Head and Albert Dock beside the River Mersey. 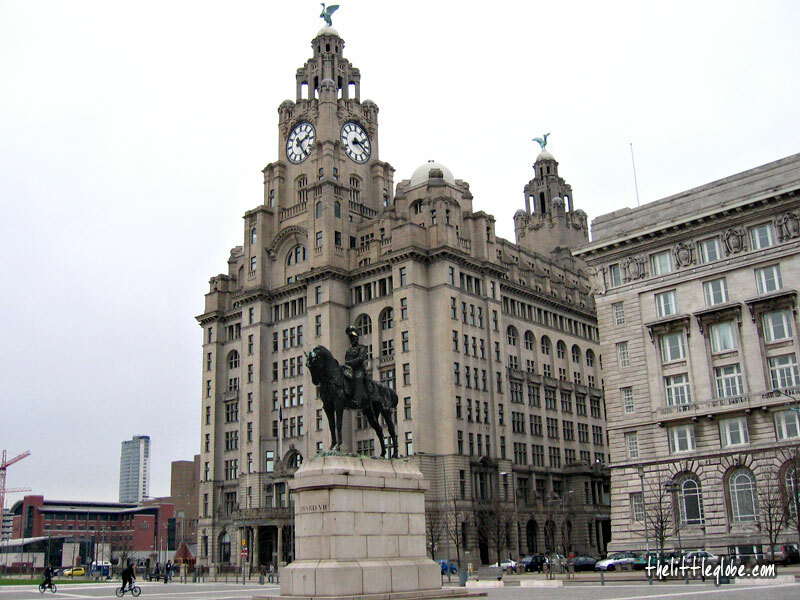 The Royal Liver Building, a recognised landmark with two copper Liver Birds perched on top of the towers was completed in 1911. 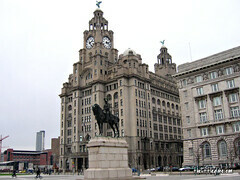 Together with The Cunard and the Port of Liverpool buildings they dominate the skyline of the waterfront in Liverpool. 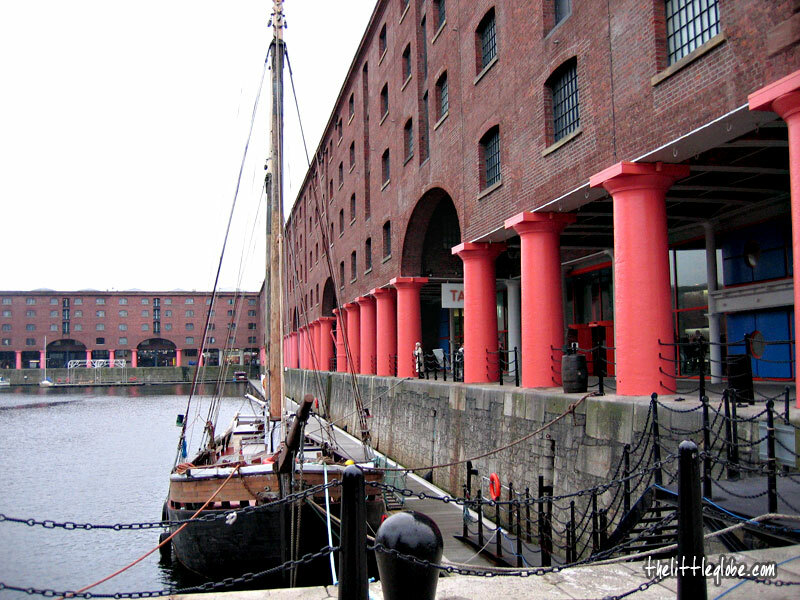 I then moved on from the Pier Head to take some more photos at Albert Dock. 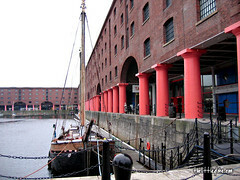 With docks and five warehouses surrounding it, Albert Dock was opened in 1846 but became less important in the 1990’s and closed down in 1972. It currently houses restaurants, galleries, museums, shops, offices and of course the Beatles Story (a museum that exhibits everything about the fabulous four). That evening after dinner, my friend and I had a few drinks in some pubs on Mathew Street. 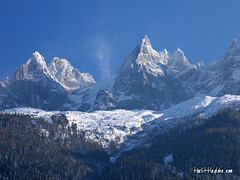 Next day, I went to visit the two cathedrals. 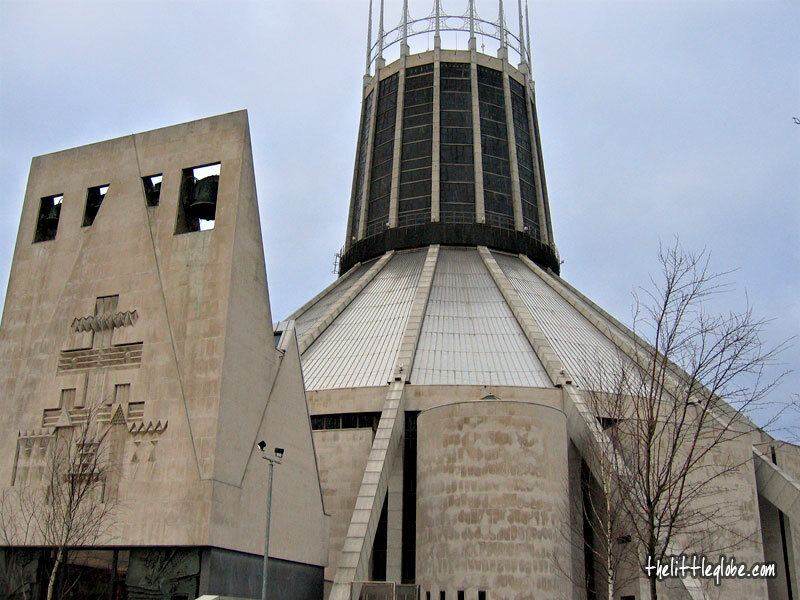 The Metropolitan Cathedral of Roman Catholic is a circular building with striking modern design built in the late 1960’s. The other one, the Gothic style Anglican Cathedral is the largest cathedral in Britain. Before going to the airport for the evening flight back to Paris, I visited the University of Liverpool in the city centre and the home ground of Liverpool Football Club. A train journey from Cologne to Heidelberg starting at daybreak, the scenery along was nothing exceptional though. 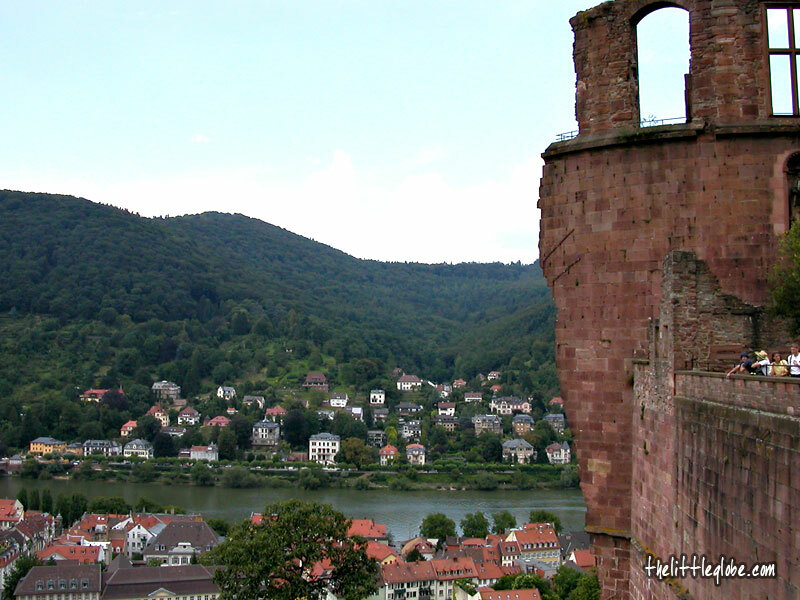 Anyway, nothing could go wrong by visiting a city with a world famous medieval castle, a rather old university, an old bridge(Alte Brücke) with Baroque towers over the River Neckar, the old town(Altstadt) and more. We got off the train and noticed that the tourist information centre was just right in front of the station. 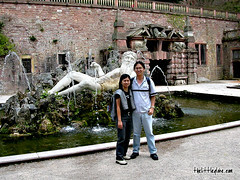 From there we got a tourist map for Heidelberg and booked a room for a night in an inexpensive hotel. After a short rest, we got something for breakfast from nearby a supermarket and soon we were ready for sightseeing. First, we went to the castle and were just on time to join the English guided tour. 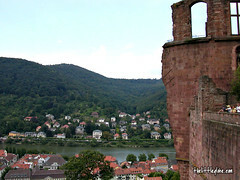 I found it very interesting and particularly enjoyed the view of the riverbanks from the castle. 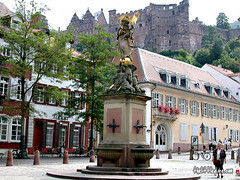 The castle served as the residence of the Prince Electors in Heidelberg from the 14th to the 18th century. 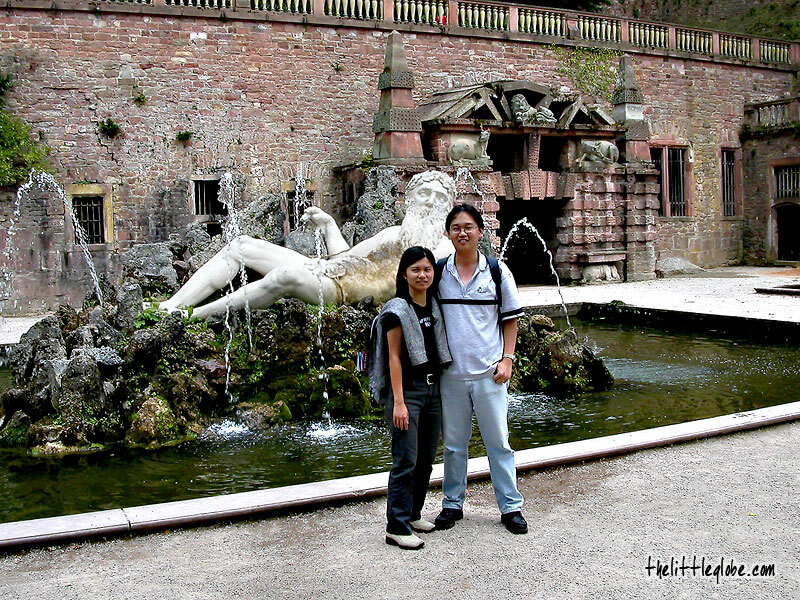 We later visited the castle gardens, a very nice place to walk around with grottos, terraces, a pond with a sculpture of a resting "Father Rhine” and a wonderful view of the east front of the castle. Leaving the castle, we leisurely walked around the old part of the city seeing the Old University, University Library, Church of the Holy Spirit, Jesuit Church and other main sights around. 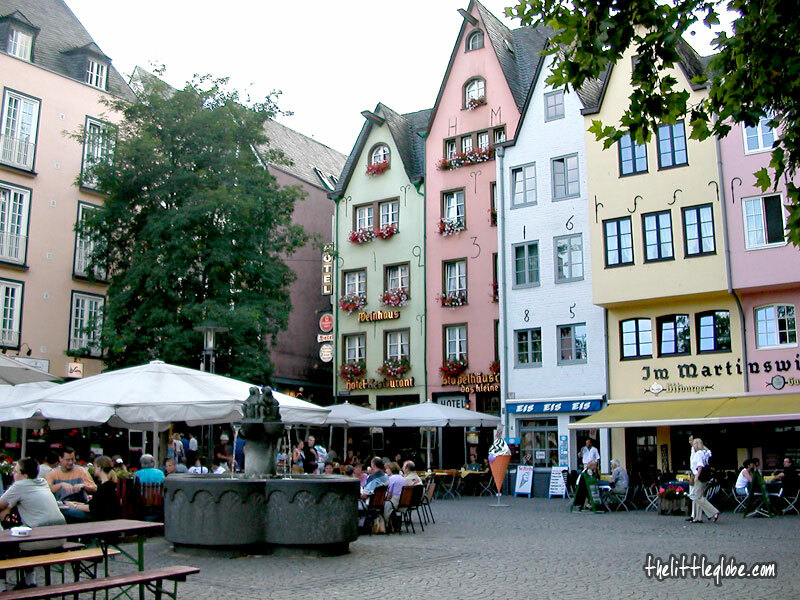 We then strolled around the shopping area in Der Hauptstraße and picked up a very late lunch. After all that, we decided to take a look at the Old Bridge and wandering along the riverbanks. Too much of walking for a day, we decided to then head back to our budget hotel and had an early night considering that we would have more travelling to do the next morning. We didn't know much about what to see in Cologne but one thing we had in mind - let's go and check out the place where Cologne Water (Eau de Cologne) originated. We boarded the high speed train from Brussels Midi and arrived in Cologne HBF(main train station) in two hours and twenty minutes. After checking in to the hotel, we made a visit to the tourist information centre across the road from the train station and right in front of the landmark of Cologne - the Cathedral (Der Kölner Dom). 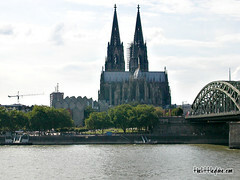 Cologne Cathedral, a famous Gothic structure and also the largest cathedral in Germany took 632 years(1248-1880) to complete. We spent quite a fair bit of time admiring the amazing two spired 157m high cathedral and the square (Frankenplazt) next to it. For lunch we dropped by a restaurant along Am Hof to sample Kölsch(beers brewed in Cologne) and local sausages. We met friendly people and had great beers! 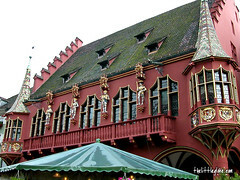 Next, we visited the Rathaus(Town Hall) those picturesque houses on Fischmarkt and took lots of photos. There's much to see in this city, so we decided to spend another night here. That night we walked along the romantic Rhine riverside - great views indeed! The next day we vistied the original No.4711 Eau de Cologne shop (if you are there, check out the cologne fountain), highstreets, old town and a few of Cologne's picturesque squares as well as some churches of Romanesque architecture. Church of St. Martin is one of the more remarkable ones. It was so nice that we went back to the riverside and spent a couple of hours there people-watching while enjoying the beautiful scenery. 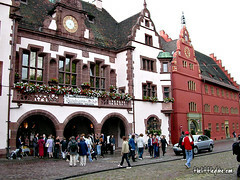 The following morning we took the early train to our next destination - Heidelberg. 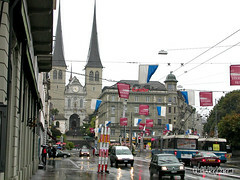 It was raining when we arrived at the train station in Lucerne from Basel in a Summer morning. 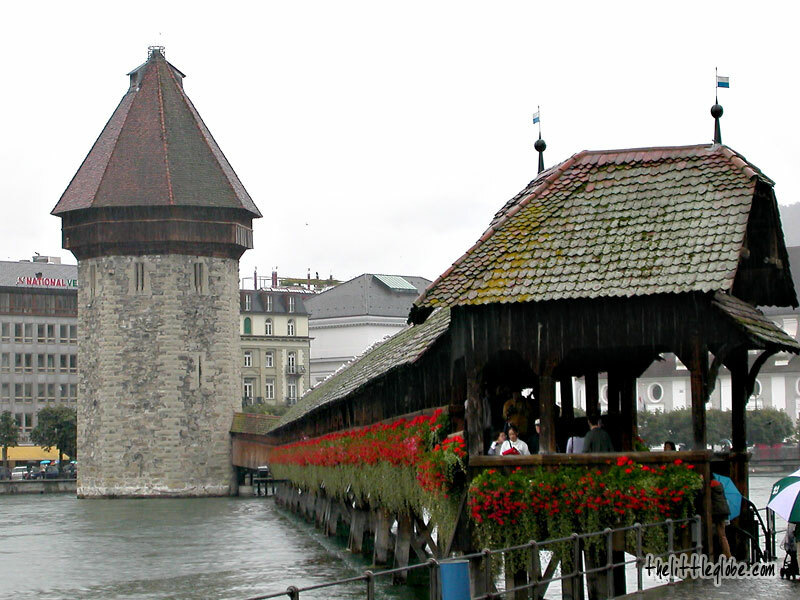 Lucerne is a picturesque town in Switzerland with the settings of Swiss Alps, Lake Lucerne and its medieval old town. As stated in my copy of Thomas Cook European Timetable that we had just over three hours before our next train to Interlaken was due. So, we had time to do some sightseeing around the town. Before we started, we needed to first buy our first Swiss souvenir of the trip, an umbralla for that(it was raining, remember?). 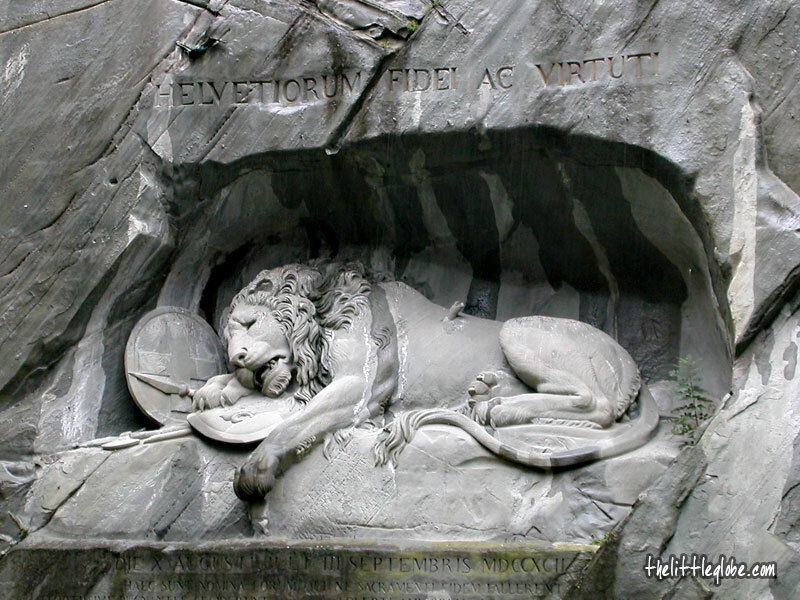 After a quick and simple breakfast at the train station, we headed straight to the Lion Monument that commeorates the heroic deaths of hundreds of the Swiss mercenaries at the Tuileries in Paris in 1792. 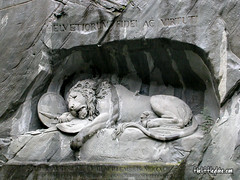 The monument was carved out of a rock in 1821. Not much to our surprise when we got there, a busload of tourists were taking pictures. Afterthat, we strolled around the old town for some churches, bridges, narrow streets, towers, squares and so on(it was still raining, really not much to do). My wife enjoyed the walk in the rain with me though. 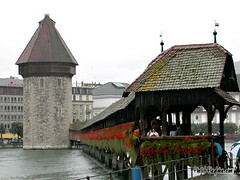 Later, we went to take a look at the trademark of Lucerne, the Chapel Bridge and the Water Tower. The bridge was first built in the 14th century but was burnt down a few times and rebuilt. I think the latest version of the bridge was from the 1990's. It's time to get back to the train station. 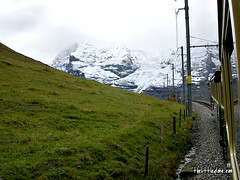 We were on our way to Interlaken. This was actually my second visit to Lucerne, I was there a few Summers ago when I was en route to Mt. Pilatus. I was born and brought up in this town. 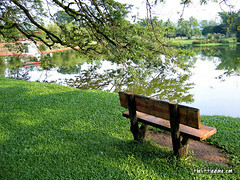 Taiping is a town located in the northern state of Perak, Malaysia, it's about a three-hour drive from Kuala Lumpur or an hour drive from Penang. Taiping started as a tin mining town in the middle of the 19th century. It quickly flourished through the first half of the 20th century as the British colonial administration centre for the state of Perak and tin mining hub. 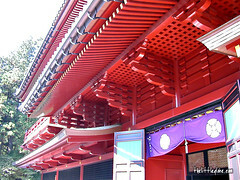 The name "Tai Ping" means eternal peace in Chinese. Today this peaceful and beautiful town enjoys a relaxed and casual atmosphere with much of its previous political roles gone. Taiping has lots of sights to offer tourists such as the Lake Gardens(photo on the right), a hill resort(Bukit Larut/Maxwell Hill), old churches, mosques, temples and colonial administrative buildings. 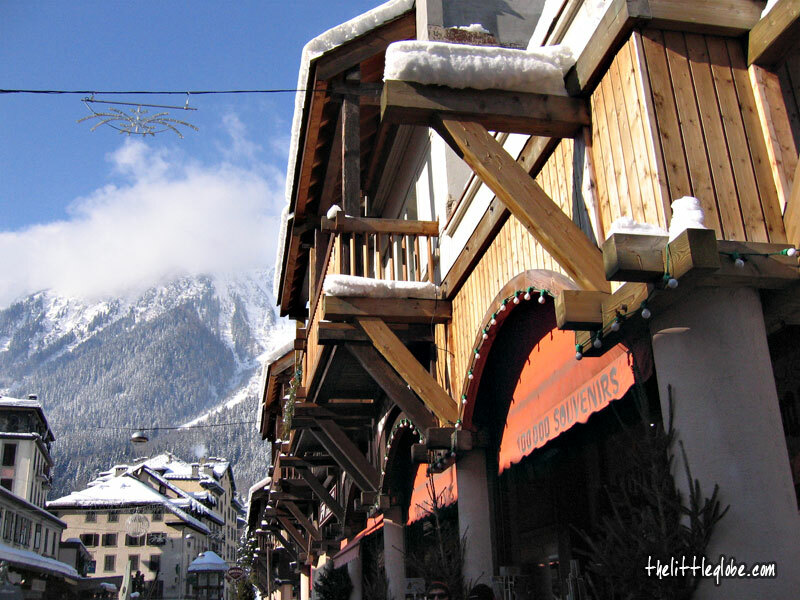 This town is also a perfect place to sample local food as well as seafood fresh from the neighbouring fishing villages. 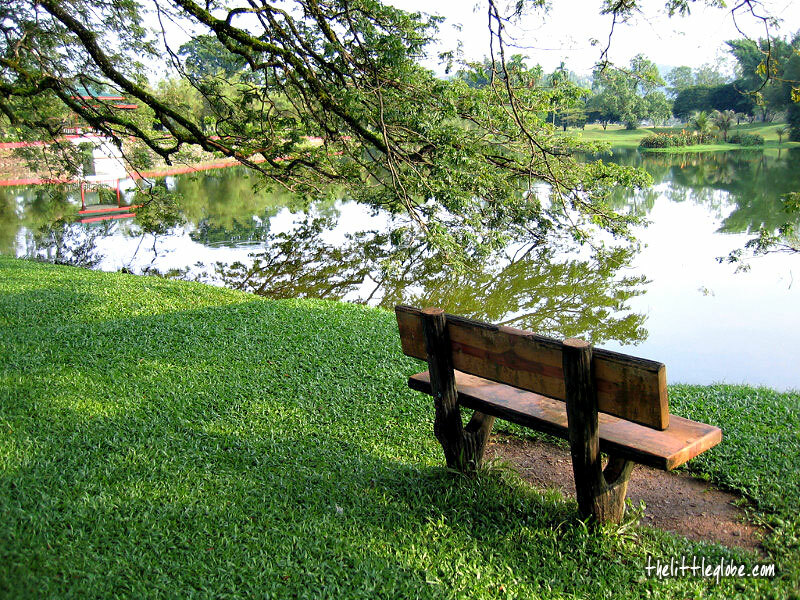 Off the beaten track, Taiping receives few tourists.